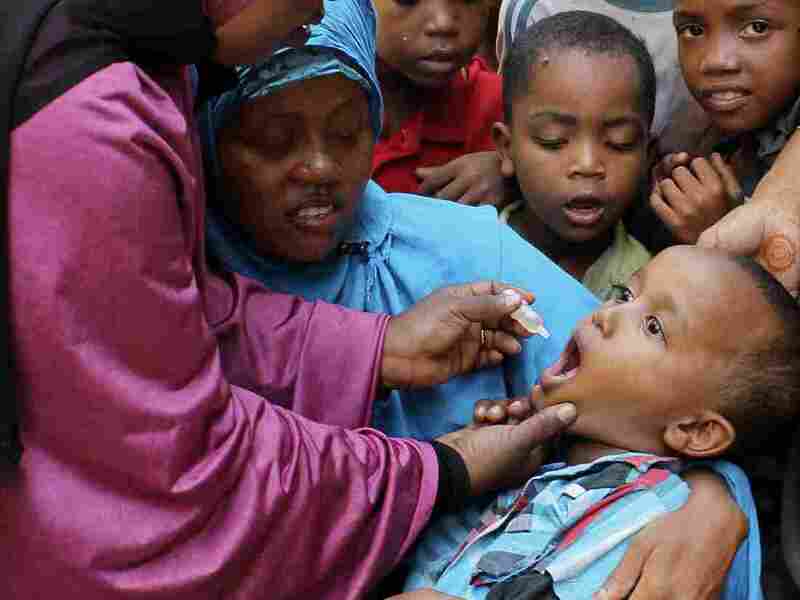 Polio Outbreak In Somalia Jeopardizes Global Eradication : Shots - Health News The world is closer than ever to wiping out polio. But a growing outbreak in the Horn of Africa has health workers worried that the virus could spread to surrounding regions. Thirty-one kids have been paralyzed by the poliovirus in the past two months, and the number is expected to rise. Health workers vaccinate a boy against polio at a May immunization drive in Mogadishu, Somalia. A big worry among people trying to wipe out polio is that the virus will regain a foothold, somewhere to launch a comeback — someplace, perhaps, like Somalia. Polio has paralyzed 25 kids in Somalia and another six in a Kenyan refugee camp since early May, the Global Polio Eradication Initiative reported Wednesday. Before this outbreak, Somalia hadn't had a polio case in more than five years. There were only 223 polio cases around the world in 2012, the lowest ever recorded. Even in the remaining three endemic countries — Afghanistan, Pakistan and Nigeria — polio was only showing up isolated in a few remote areas. This outbreak in Somalia could threaten that progress. The recent cases are probably just the tip of the iceberg, says Sona Bari, from the World Health Organization. "The last time we saw an outbreak in this part of the world it involved Yemen, most of the countries in the Horn of Africa, Sudan and led to about 700 cases," Bari says. Somalia is a tough place to fight polio. It has very low rates of immunization for most diseases, including polio. Vaccination teams can't even enter parts of Somalia because of violence. Just last week, Islamic extremists launched a suicide attack on the United Nations headquarters in Mogadishu. After a 90-minute gun battle, 22 people at the compound died. Despite the security problems in Somalia, emergency responses to the polio cases are underway. Local health officials in Somalia have launched three massive vaccination drives, Bari says, and Kenya has already carried out two special immunization campaigns in the refugee camp. When outbreaks like these occur, she says, the goal is to break the poliovirus's transmission cycle by trying to get more than 90 percent of the local population vaccinated. "The virus is looking for children in which it can circulate," Bari says. "The virus can't live out in the sewage or in the environment on its own. So it needs human beings. And it looks for people who are not immune, who are going to allow it to continue transmitting." This outbreak is still in its early stages, she says. And WHO expects to see more polio cases reported from Somalia in the coming weeks. But, Bari says, polio workers are hopeful that the emergency vaccination campaigns are reaching enough children to slow the spread of the virus. There have been 77 polio cases reported worldwide so far this year, compared with 84 to this point in 2012. But almost half of this year's cases have occurred in Somalia and Kenya.